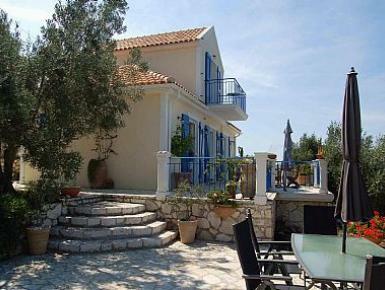 Villa Lithia is a perfect holiday location, set in the hills above the chic harbour of Fiscardo. Lithia offers, tranquility and privacy in a traditional villa offering flexible accommodation and modern amenities. We think the views from the Villa are second to none. The pool is private and the garden well established. It is a 15 minute walk to the village of Maganos which has two Tavernas and two mini-markets. WiFi is available at the Ionio in Maganos. Drive further down the hill to the village of Antipata which has two traditional tavernas and a cafe, there is WiFi available here to. Fiscardo offers a choice of bars and restaurants and a wonderful place to watch the world with a glass of wine! The beaches of Foki, Emblissi and Dafnoudi are within easy distance. The world famous beach of Mirtos is a must visit. Fiscardo offers, boat hire (we can pre-book this for you), sailing and scuba.